Whether you’re hankering for a delicious Pad Thai or want to experience Thailand without having to leave your home City – you’ll be amazed at the variety of restaurants in Leeds which specialise in Thai cuisine. It’s undeniable that Thai cuisine has been subject to a boom in recent years. 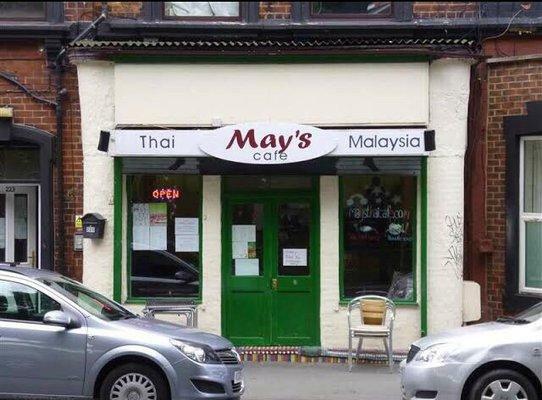 There are many Thai restaurants in Leeds. Across the UK, this South East Asian cuisine has become one of the new staples of the British diet! I’ve always been a bit basic when it comes to cooking for myself – but even I regularly whip up a Thai Green Curry on a semi-regular basis. In Leeds, there’s a vibrant, eclectic selection of Thai restaurants, all delivering their own, unique take on the delicious and ever-popular cuisine. 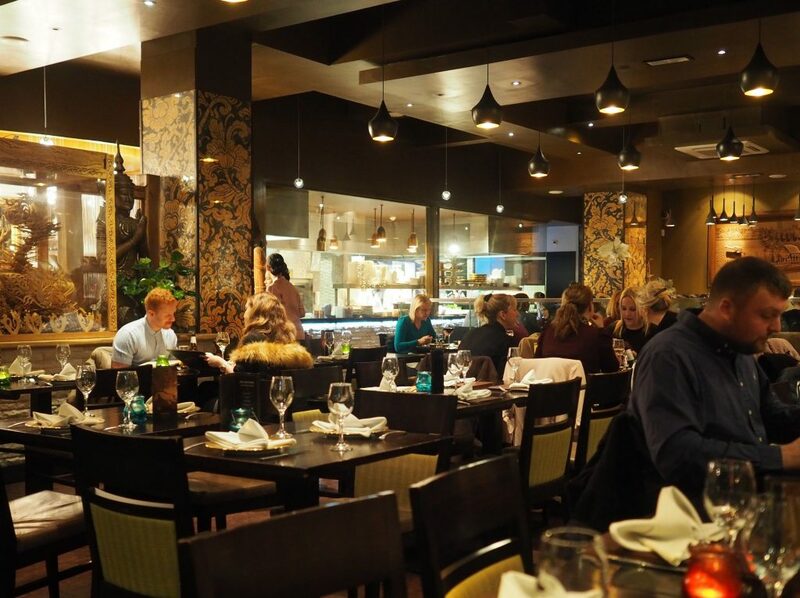 If Thai’s not your thing, but you’re pining for a meal out – check out our comprehensive round-up of the where to find the best restaurants in Leeds. From Thai Street food to high-end restaurants, there’s something for everyone and a restaurant perfect for every price point. In fact, there’s so much on offer – it can be difficult to know where to start. 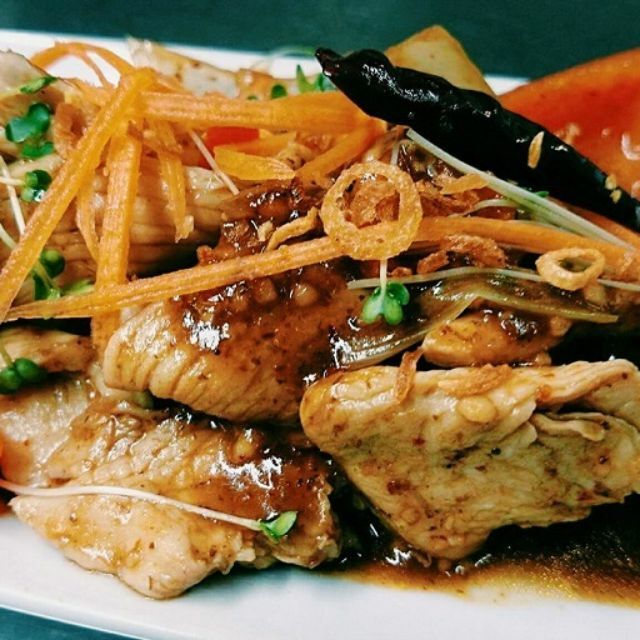 With that in mind, I’m taking a look at 16 of the best Thai restaurants in Leeds – to help you make the most of your next meal out. With more and more Brits choosing to travel to Thailand, whether for a gap year adventure or a relaxed couples holiday, Thai cuisine has made its way back to Britain in a big way. The Thai method of cooking emphasises lightly prepared food with a focus on aroma and spice. Thai food can be characterized as “intricacy; attention to detail; texture; colour; taste; and the use of ingredients with medicinal benefits, as well as good flavour.” Appearance is a big part of Thai cuisine, and many of the Leeds Thai Restaurants demonstrate lot’s of passion through their bright and colourful dishes, which as much a feast for the eyes as they are for the palette. Many of the nations most prominent dishes, such as Thai Green Curry have now found their way to a staple of the British public’s diet. Although that’s just scratching the surface of the vibrancy and diversity of the dishes associated with a country of Thailands size, more and more people are becoming accustomed to Thai food and these fantastic Thai restaurants are the perfect place to start for anyone looking to gain more knowledge and understanding when it comes to Thai cuisine. Although we urge you to get out there and try the fabulous restaurants below, the ingredients needed to make your own Thai food are readily available at many British supermarkets (the more specialist ingredients are often available at oriental markets which are in most major cities) and you can easily try your hand at creating your own version at home. We’ve spoken with many of the restaurants on the list below and asked them to give us some recipes that people can try at home. 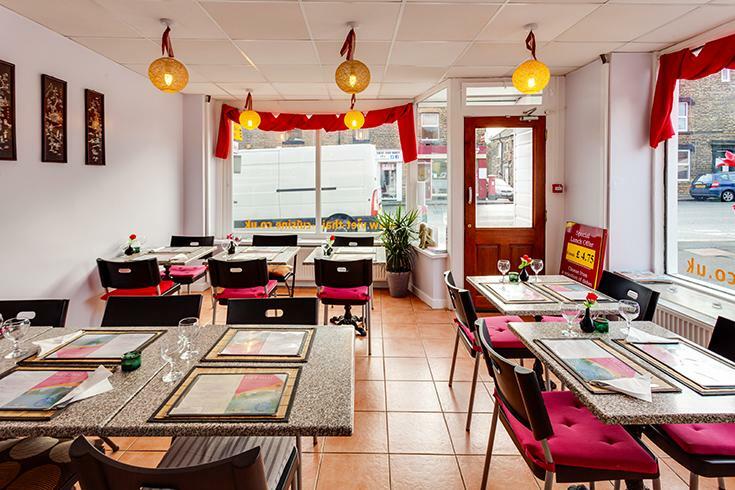 Zaap Thai Leeds is a colourful restaurant which is always buzzing with customers. They aim to recreate the feeling of visiting a Bangkok market. 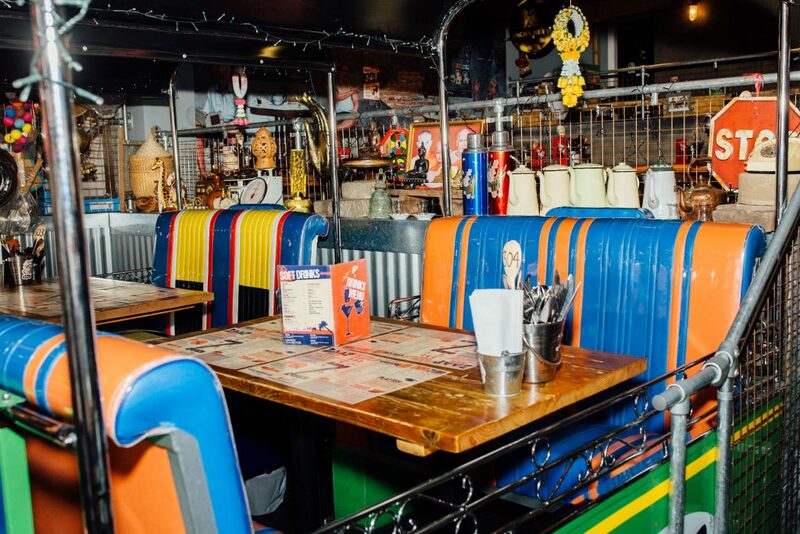 The restaurant is kitted out with all kinds of Thai ornaments, and even tuk-tuks which serve as dining areas. They have a massive selection on the menu, with over 100 dishes, but don’t worry, the helpful front of house staff are on hand to talk you through and offer their own recommendations. They have everything from Gang Ped, Tom Yum and Pad Thai, although for the more adventurous amongst you, there’s plenty on offer for you to explore. Zaap is a great location for lunch and with mains ranging from £7.50 to £15.95 it’s very reasonably priced. If visiting on a weekend, booking ahead is advised. 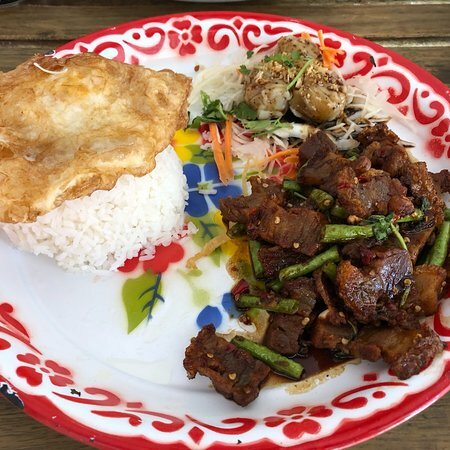 Last time I ate at Zaap Thai I was really impressed – our waiter was really enthusiastic, gave us a big welcome and help my date and I navigate the extensive menu. Sure, it’s not a fine dining experience – but that’s not what draws people here. It’s a little slice of the hustle and bustle of Bangkok, and it’s perfect for those who like something a little different. 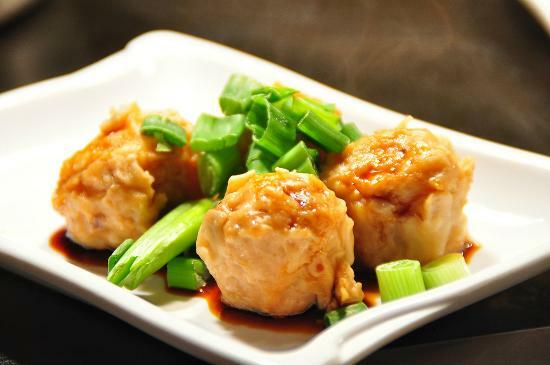 If you want to impress a date who like Thai – Zaap Thai’s perfect. Sukhothai is one of Leeds best Thai restaurants and offers a diverse range of Thai dishes including the likes of Phed Pad Prik Gang. There are two locations in Leeds, which are popular with many fans of Thai cuisine. Their owner, Ban Kaewkraihgot ran a successful restaurant in Bangkok for 8 years and headed a well-known Yorkshire restaurant before opening the first Sukhothai restaurant in Chapel Allerton back in 2002. Since then it’s become known as one of the regions best restaurants. I’ve eaten at both the restaurants in Leeds, and I’ve always been impressed. 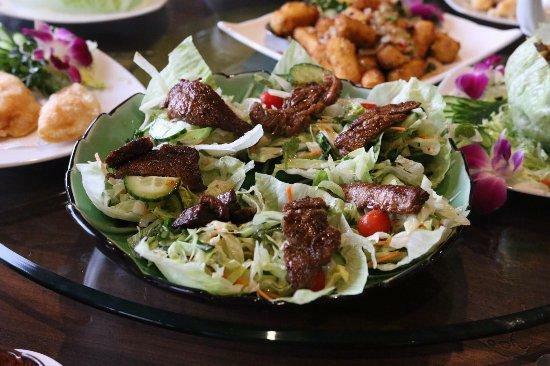 Mommy Thai is the place to be if you’re an adventurous eater. Their menu is about as diverse as you’ll find in Leeds and the likes of raw prawns and pig stomach are available to those who’re that way inclined. That being said, they do have an eclectic offering, so if you’re looking for something more westernized, you’re catered for too. What’s more, it’s fantastic value for money and is one to put on your Thai food bucket list. Line Thai Oriental is an unassuming restaurant with an open kitchen where you can watch the chefs putting together a myriad of tasty Thai dishes. It’s one of the most affordable restaurants on this list, with main dishes ranging from as little as £7. It has attracted attention recently for its Vegan and Vegetarian menu, which offers something a little different, and is among the most delicious available in Leeds! Tamarind Thai Kitchen is all about freshness and bold flavour. It is a small and stylish restaurant with style reminiscent of a Thai temple. The menu is filled with all kinds of Thai favourites, including some creative chef specials. Their Jungle Curry and Weeping Tiger are just two of their recommended favourite dishes. My Thai offers a traditional Bangkok style dining experience. What’s more, it’s well priced and delicious. 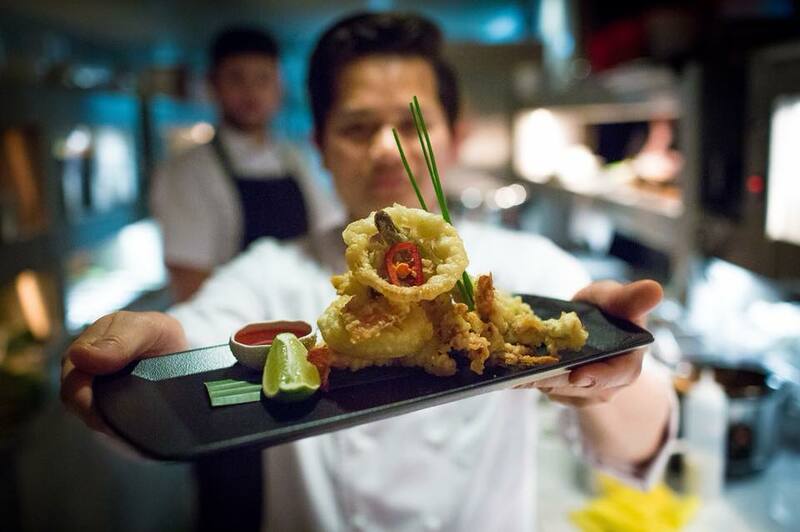 Inspired by the capital of Thailand, the menu is eclectic, with something for all tastes. You can find Tom Yum Soup and Thai Green Curry to name but a few and main courses start at £6.50. With it’s industrial chic decor, it’s a great location for a late lunch or after work catch up in Leeds. 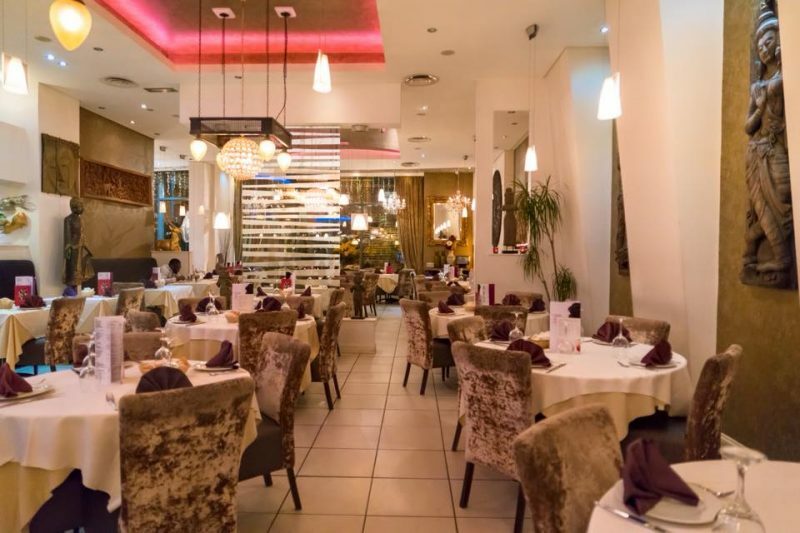 Chaophraya is a fine dining Thai restaurant with lavish interiors, a private room and sunken seating. Starters start at £6.95 and mains at £10.95. We particularly like the sound of the dishes on their ‘Thai Re-imagined’ menu which features tempting creations such as Ceviche Scallop Chilli & Dressing Nasturtiums and Tom Yum Roast Duck Wings. Although no the most modestly priced restaurant on this list, those who’ve been to Chaophraya before are almost certain to return. Thai Edge is a beautifully decorated restaurant with pretty upholstered chairs and Thai stone-work, overlooking Leeds’ Millennium Square. The menu here is pretty extensive – you’ve got a whopping 145 dishes to choose from! Their renowned Head Chef combines his culinary heritage with his years of training to produce some truly delicious dishes made with the freshest of ingredients. If you’re looking for somewhere a little more informal to indulge in the aromatic flavours of the East, then this is the place for you! Thai Sabai literally means ‘a feeling of well-being, a place to relax’ and their modest interiors and friendly staff certainly reflect this. They have an excellent menu of starters, mains, sides and desserts but if you struggle with decision making, opt for one of their set menus which start at 18.95 pp. 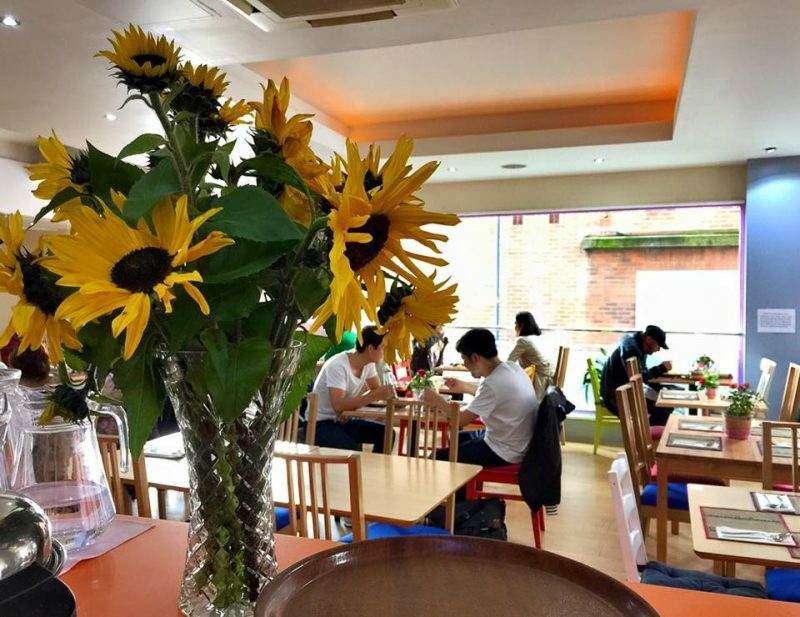 Jino’s Thai Cafe is a simple yet welcoming family-run Thai restaurant in Headingley. It is a cafe-style venue which offers delicious, well priced dishes. They’re a popular lunch venue and their extensive menu of noodle dishes are always a winner! If noodles aren’t your thing, they have a selection of curries which are a real crowd pleaser. 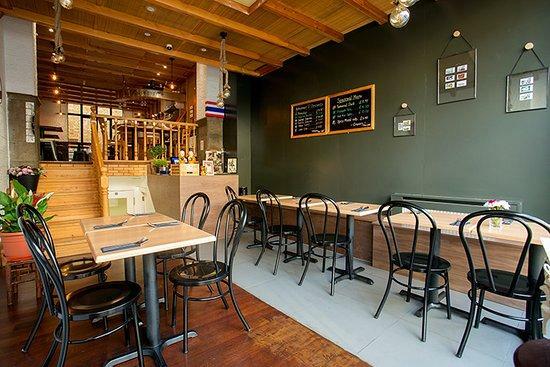 Found in the heart of Hyde Park and a firm favourite among students, May’s Thai Cafe is a compact and charming cafe. Although it can only seat roughly 20 people, it’s often packed, which is a testiment to its fantastic food. It’s also really well priced, with highlights on the menu including the likes of Thai style chicken curry. 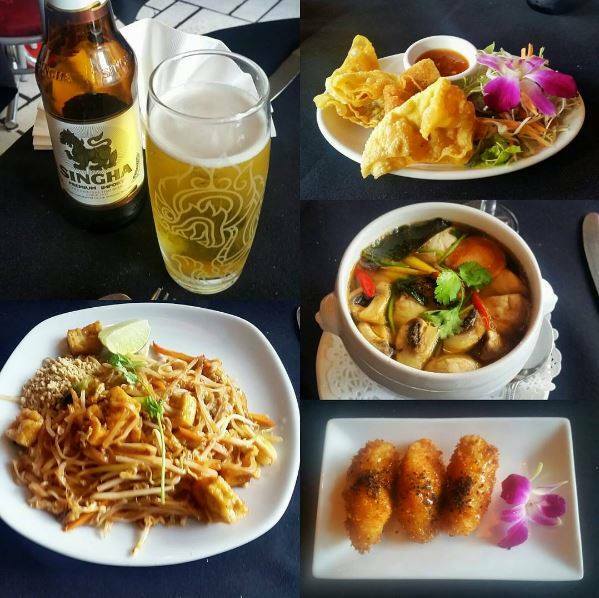 Thai sun is a family-run restaurant within a pub that’s been remodelled to express a real flavour of Thailand! They have a large menu with all sorts of Thai classics such as soups, curries and noodle dishes. They’re also an affordable option, well worth visiting if you enjoy the more traditional side of Thai cuisine. 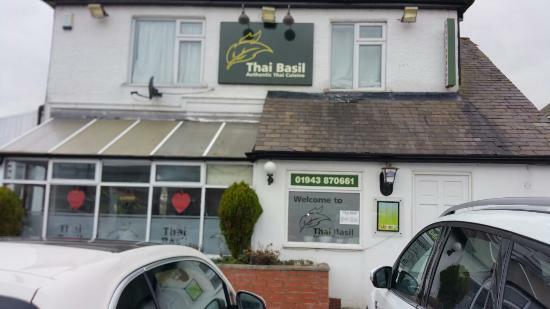 Thai Basil is a fantastic Thai Restaurant in Guiseley. It has a great reputation within the Guiseley community and has been there for many years. 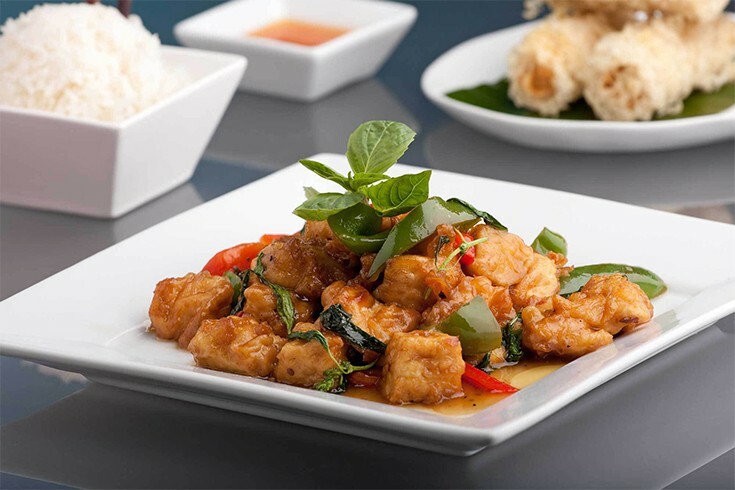 The menu promises a great range of Thai dishes with classics such as Pad Thai and Thai red curries, although they offer a great range of seafood dishes which come highly recommended. Found on Yeadon roundabout, Sweet Basil Valley offer a great and eclectic mix of both Thai and Chinese cuisine. It’s in a creatively decorated building and offers great value and brilliant service. They’re really popular, so make sure you book ahead! 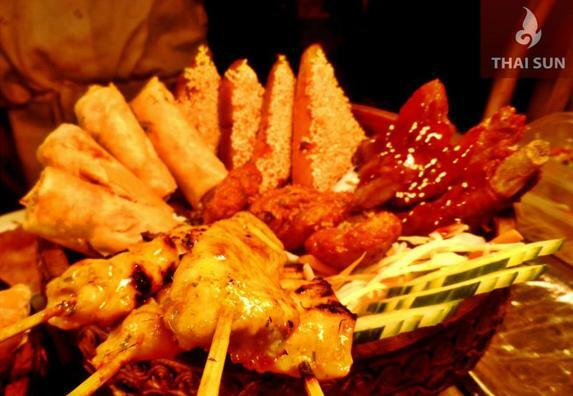 Vote for your favourite Thai Restaurants in Leeds.